I want to talk to you this month about commitment. Let’s look together at a powerful passage that speaks to the level of our commitment. “For the eyes of the Lord range throughout the earth to strengthen those whose hearts are fully committed to him” (2 Chronicles 16:9, NIV). “For the eyes of the LORD run to and fro throughout the whole earth, to show himself strong in the behalf of them whose heart is perfect toward him” (KJV). “For the eyes of the LORD run to and fro throughout the whole earth, to give strong support to those whose heart is blameless toward him” (ESV). We find several references in scripture mentioning that Jehovah literally goes to and fro throughout the earth (see Job 1:7, 2:2). In Zechariah 4:10, (and also Jeremiah 5:1) we find, “... the eyes of the Lord, ... run to and fro through the whole earth.” The Lord is ceaselessly watchful for occasions to help the faithful! God’s word gives us the promise that “He that keepeth Israel shall neither slumber nor sleep” (Psalm 121:4, KJV). Hallelujah! Will you accept the fact that God is constantly looking to and fro to show himself strong in behalf of, to give strong support to, and to strengthen those whose hearts are fully committed to Him? God rewards committed hearts that are fully focused on Him! In Psalms 139, David writes, “He knows my thoughts from afar.” God is always constantly aware of our challenges and our situations. So, our conclusion should likely be that the eyes of the Lord are watching. Think about that! The all-powerful God of the universe, the creator of heaven and earth, is looking and seeking to strongly support those who have their heart fully committed to Him. The Lord is pursuing those whose hearts are committed! The statement, “The eyes of the Lord run to and fro,” by the prophet Hanani reflect that this was not a one-time event for God. It is His constant practice. When Daniel was in the lion’s den, God was there fully supporting Daniel. When Shadrack, Meshach, and Abednego were in the fiery furnace, God was the fourth person in the fire. When Moses crossed the Red Sea, God was there. When Joshua fought the Battle of Jericho, God gave them the city. When Paul was shipwrecked, bitten by a snake, imprisoned and in front of Roman leaders, God was with him. When David faced a lion, a bear, and Goliath, God was his strength. How different are we when we know someone is watching us? How differently do we behave? Why would the prophet, Hanani, say these particular words to Asa? The best way to understand these words is to become acquainted with the context of 2 Chronicles 16:9. Begin reading from chapter 14 through chapter 15, and read about Asa’s life. He succeeded his father as king. Let’s look at 2 Chronicles 14 and 15. Vs. 2 - Asa did what was good and right in the eyes of the Lord. Vs. 3 - He removed the foreign altars, the high places, smashed the sacred stones and cut down the Asherah poles. Vs. 4 - He commanded Judah to seek the Lord and to obey His laws. Vs. 5 - He removed the high places and altars of incense in every town, and the kingdom was at peace under him. Early on, when his enemies did come up against him (an overwhelming army of 800,000 soldiers and chariots), Asa depended on the Lord. He called on the Lord, he received the support of the Lord. He destroyed the Cushite army. Vs. 8 - When Asa heard these words, he took courage and removed the detestable things from the whole land of Judah and the cities they conquered. He repaired the altar of the Lord. Why? Because it was not being used or being maintained. Rebuilding the altar is critical to all of us. Vs. 16 - Asa even deposed his grandmother, Maakah, from her position, because she had made a repulsive image for the worship of Asherah. Asa cut it down, broke it up, and burned it in the Kidron Valley. Asa led the nation into obedience to God. He faithfully followed the Lord. His heart was fully committed. For years, they were at peace and had the favor of the Lord on them as a nation. No war for 35 years! Rather, they had peace and prosperity. This time, Asa behaved differently. Asa, the king who had once depended on and trusted the Lord, was now looking to man for assurances. Asa hired a bunch of mercenaries from Syria with the gold and silver from the temple and failed to trust in the Lord. He relied on his own strength. Asa failed to trust the Lord in the 36th year of his reign. God had proven himself faithful to Asa for so long, so why would he not trust God now? 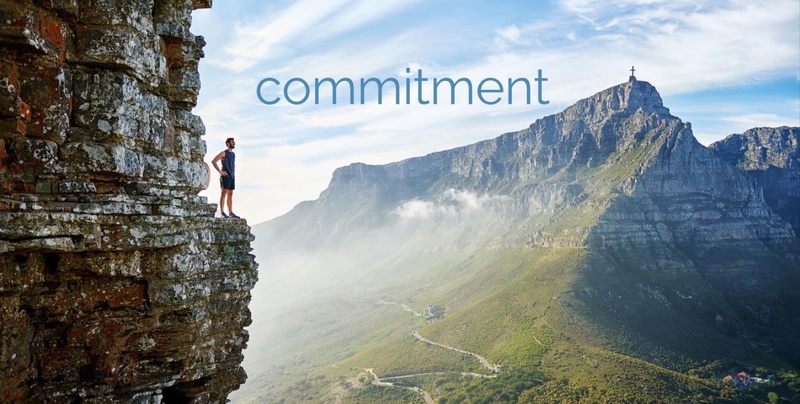 I think we must ask ourselves, “What does it mean to be fully committed and stay fully committed?” Let’s talk about commitment for a minute. If you aspire to have a heart fully committed to God, the commitment is generally the outcome of an encounter with God. Making a commitment involves dedicating yourself to something, like a person or a cause. Before you make a commitment, think carefully. A commitment obligates you to do something. Some commitments are large, like marriage or launching a new business. Commitment includes the responsibility to practice specific activities – to do, cause, commit, or practice. Listen, nothing happens without commitment! You can’t even make a purchase without commitment. “Some people want everything to be perfect before they're willing to commit... but commitment always precedes achievement. Commitment comes as a result of choice, not conditions” (John Maxwell). Some are committed until it is inconvenient to be committed. In the Swiss Alps, there is a mountain climbing trail that has a lodge at the halfway point. Hikers will start out the day determined to climb to the top of the mountain and reach their goal. As they climb through the snow, the altitude begins to have an effect, and they are overjoyed to reach the halfway point. There is a warm fire waiting with drinks, laughing, others who are pausing, and enjoyable views and resting. The cabin is filled with joy, laughter and celebration for reaching the halfway point. However, the longer the hikers linger in the lodge and the later it gets in the day, the atmosphere in the lodge changes. In the latter part of the day, those in the cabin realize that they will not meet their goal. They will not get to the top. They will miss out on the views from the top, and they have settled for halfway; it is discouraging. You will never win if you don’t give it your best effort. You never finish unless you keep going. You will never finish a task or goal as a team, a church, or a business unless you make a commitment. Yes, we are all tempted to quit, to give projects our half effort, to go the way of Asa and, at times, depend on the flesh instead of God. Commitment starts in the heart! If you want to complete anything, you must make a commitment. The hopes and dreams never become a reality unless you commit. The only real measure for commitment is action. Remember, commitment is generally the outcome of an encounter with God. When you have an encounter, you are changed. You will not forget that encounter, and you will revisit that moment in time often.